In this connection attention should be called to the importance of starting and maintaining the columns perfectly plumb and always in line. To do this, it is necessary that the bases should be set absolutely level, as the slightest variation at this point will increase as the work is carried to a height. 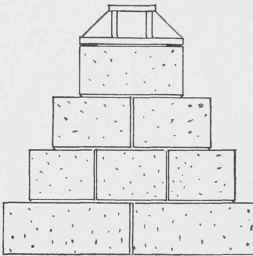 For this reason bases should never be set by means of an ordinary mason's level, but an engineer's level should be employed to insure accuracy. 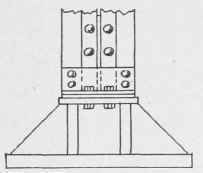 If this is done, and the end sections of the columns are milled off properly, there is no reason why perfectly plumb work should not be maintained, permitting the spliced joints of the columns to bear perfectly upon each other without the use of thin "shims," which should not be allowed. Fig. 200. Cast base for Steel Columns. Fig. 201. Steel base for Steel Columns. When splices are made at the building, the superintendent should see that the riveted surfaces are painted before being put together, and that a sufficient number of bolts are used to hold the pieces together rigidly while being riveted. Fig. 202. Splicing of Steel Column. 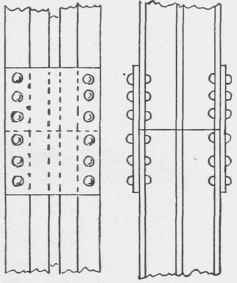 The use of splice-plates for connecting columns is to be preferred to a connection of plate and angles; and if any part of the column section projects beyond the column section below, it should not be left unsupported, but should be given a bearing on a filling plate riveted to the lower column. The rivet holes in the column and splice-plate should fit perfectly so that "drifting," i.e., straining the pieces together by means of a drift-pin, need not be resorted to; neither should heavy mauls be used to bring the members into position, but wooden mallets only. The finished rivet head should be clean and smooth without cracks or flaws, and the two heads should be concentric with the axis of the rivet. All rivets should be examined to see that they are tight and well formed. Loose rivets are often tightened by simply calking around the head with a calking tool. This should be watched for and never be allowed to pass, as a rivet so treated possesses no working strength, being tightened simply by the contact of a thin edge against the steel members. Grillage. 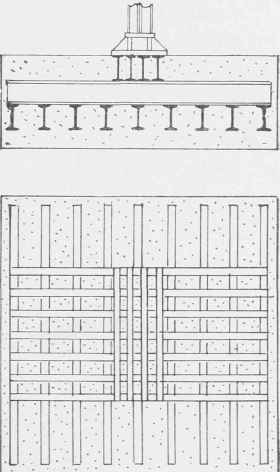 The great loads which are concentrated at the bottom of the steel columns of a high building, will, in general, require a different treatment, to secure a firm foundation, from the stepped-up foundations of stone or concrete which we have already considered, as in Fig. 203. Of course it would be possible to extend the area of the succeeding steps of an ordinary pier foundation until it covered a sufficient footing; but this would in many cases be at a great expense and loss of room - two important factors in city buildings. To overcome this, and to provide adequate foundation within reasonable limits of depth and material, the use of steel beams for foundations has become general. 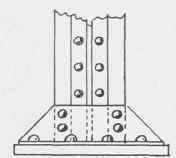 This use of beams is known as grillage, and may be used for isolated bearings or for the bearing of continuous walls. Foundations of this sort are usually prepared by laying down a bed of concrete from four inches to twelve inches in depth, and laying upon this a series of steel beams. If a wall foundation, these beams are continued at a spacing varying from six to twenty-four inches along the wall, as in Fig. 204. If a column or pier foundation, the concrete and beams will be similarly put down in a square, of an area sufficient to sustain the estimated load, and these may be crossed by another or several tiers of beams laid at right angles, each series covering; less and less of width until the footing is brought to the desired width to receive the base of the columns. (Fig. 205.) The distance apart of the beams will vary according to their length and the load to be borne, but should be at least enough to allow of filling and properly tamping the concrete between the beams. The whole is then finished flush with a bed of concrete. Sometimes the nature of the soil and the closeness of the supports will make it advisable to cover the whole area of the building with a thick bed of concrete, upon which the footings of beams or stone may be laid. Before laying the steel beams for grillage, they should be cleaned and coated with asphalt; and they should be examined before covering with concrete, and all defects found in the coating thoroughly covered. Fig. 203. Stone Footing and Base. Fig. 204. Grillage under Wall. Fig. 205. Grillage under Column. Timber is sometimes used as a grillage, in connection with piling, by bolting a series of timbers to the tops of the piles, this timber crossed by succeeding series, and the top covered with a floor of thick planks to receive the masonry.